Thanks for saving me the trouble of responding to this fuckwit, orange! What a delightful imaginary friend EGOr has! It is no wonder people like him turn out to be so twisted and perverse! He is soooooo fucked when he dies and finds out that indeed the Leprechauns (blessed be their ale) are going to pee in his dirty mouth for saying all of the wicked things that he has in life. No, what they can't imagine is God. 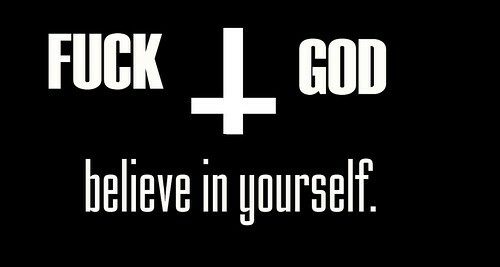 In order to believe in any of his so-called actions, first you must believe in God. Thank goodness there are people here who just can't accept the BS required in order to do that. Right, but only because you don't think you'll be going there. What a sick puppy your God is. Plus, your evidence for your theory of Hell and what happens there is, what? Be scared Ghoulslime. Really scared. And send money. Last edited by Stargazer; 02-25-2012 at 06:15 AM. Oh, he has me trembling in my underpants! Let me empty out Smelly's wallet right now! I absolutely CANNOT believe that he thinks you two are one and the same. I almost spilled my coffee. If you think they have the same tone, you are not reading very carefully. So, you think YOU'RE the life of this forum?